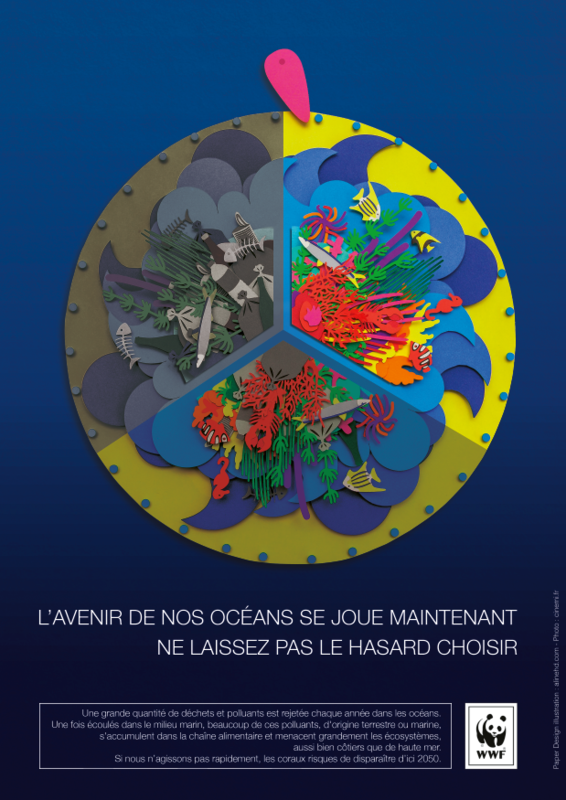 You may remember the incredibly vibrant poster depicting the effects of ocean pollution over time from Paris based paper artist Aline Houdé-Diebolt. She captured this unfortunate timeframe beautifully, while also including the bottles, cans and trash, layering to add depth to the piece. You will see her passion lies in patterns and colorful papercraft juxtapositions that have been included in a wide array of displays for windows and even some luxury brands. So let's jump right into the interview and learn a little bit more about Aline. Enjoy! We have been incredibly enamored by the body of astounding visual works through talented husband and wife duo Davy and Kristin McGuire. They have the ability to convey imaginative stories, sometimes even extremely romantic, through projection mapping animations onto large paper dioramas. The viewer is able to peer into these worlds with wonder, feeling wrapped up in these given moments as if they might be there themselves. Inspired by the papercraft aesthetics and projection techniques that they developed for their first commission from Courvoisier, Alchimie de Courvoisier, the cognac brand invited them to create paper film sets for their new campaign. The commercial above has been shown in cinemas, and the paper rendering of the Eiffel Tower and the Parisian town house for the key visual are now on display in Courvoisier‘s own museum in Jarnac, France. 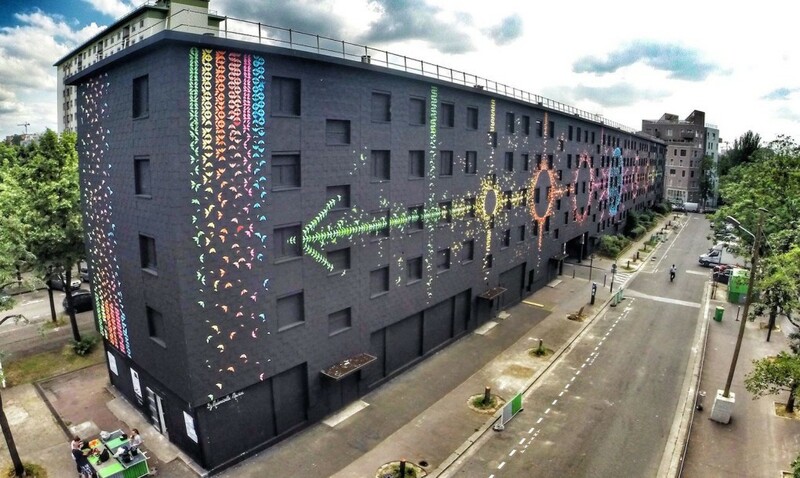 REVERBERE is a lab-workshop based in Paris where tailor-made graphic solutions are brought to life. 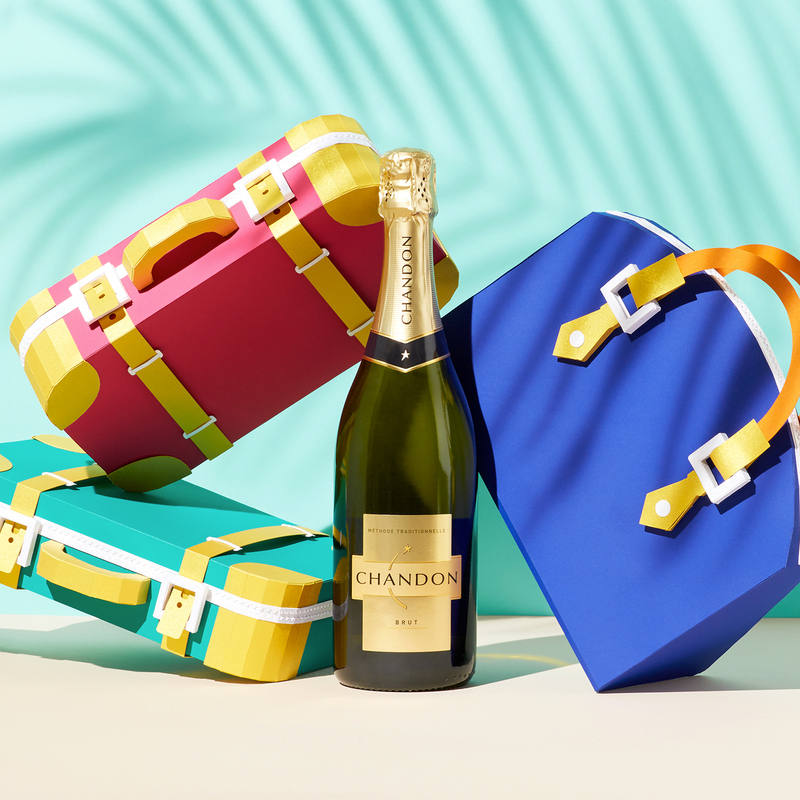 The team was tasked in the creation of the decor and accessories featured throughout this international advertising campaign for Chandon. 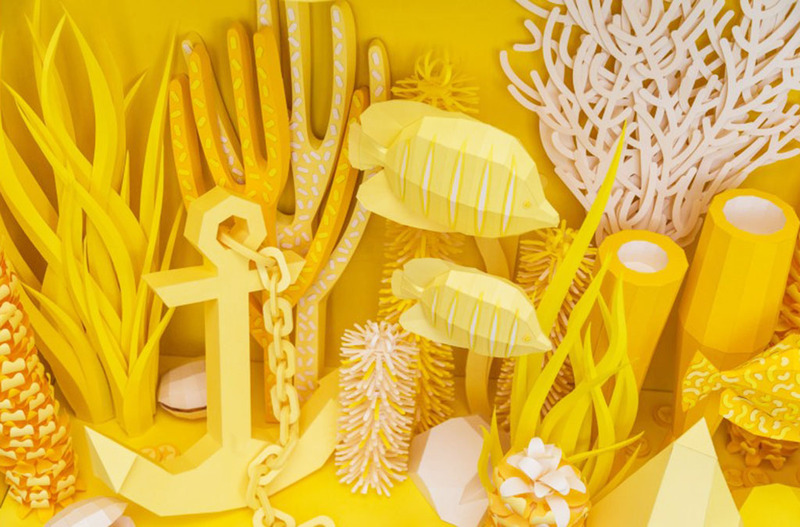 Geared toward the Millennial generation, these posters all show visuals that are bold and colorful universes of paper food, beaches and celebratory cannons, inviting us to relax and share a chilled glass of Chandon together. I honestly feel like I'm packing for a vacation with these ads, bring it! 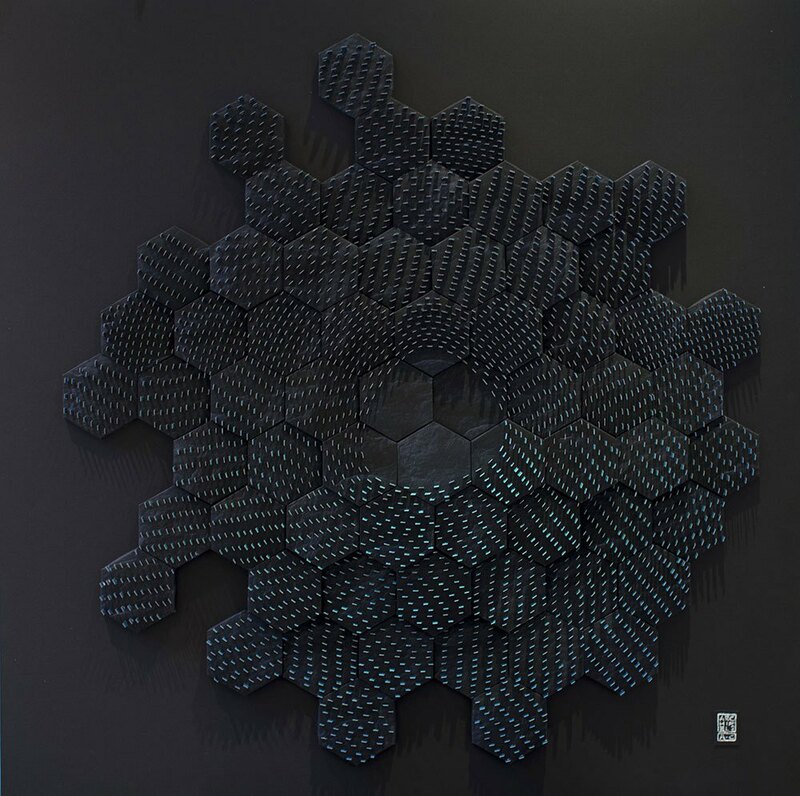 Paris based artist Agnès Cappadoro has a body of work that utilizes a hybrid quilling technique to visualize the notions of topography through pieces of art, combining photographs and sculptures, while exploring Augustin Berque’s sentence "Man is a geographic human-being." 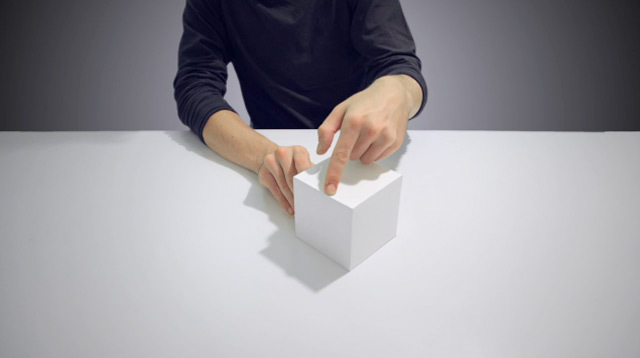 Inspired by minimalism, kinetic art and photography, she creates sculptures that mimic geometrical paintings and settings that transmit the vision and relationship between works of art and bodies. She documents impermanence and a constantly changing geography. Her work, calling for contemplation, is a long meditation where patience is simultaneously a process, a medium, a message and a goal. French artist Nathalie Boutté is self-taught collage artist who creates absolutely stunning portraits, seen previously, comprised of thousands of meticulously placed strips of Japanese paper. She cuts long narrow strips of translucent paper that she patiently assembles, one by one creating a feathered effect which constantly evolves. 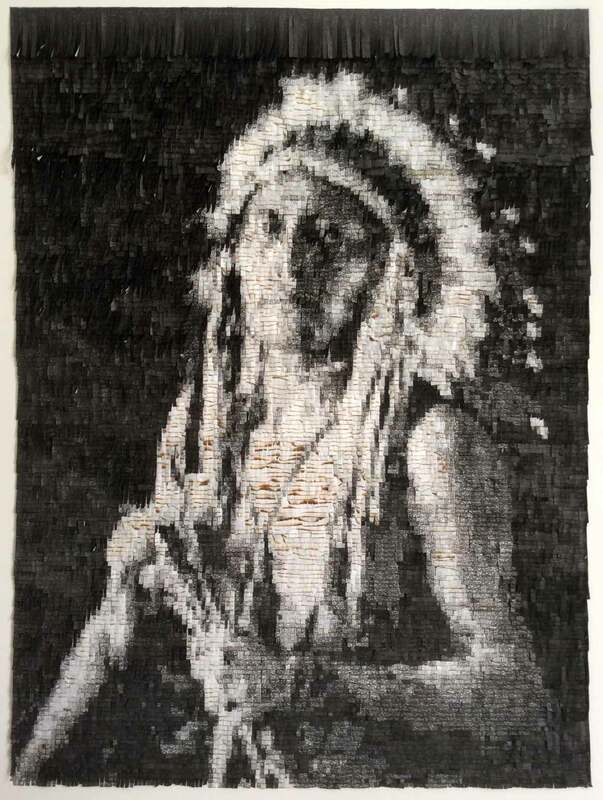 These strips of paper are sometimes burned, like in the collage featured above or covered in letters to form the striking details in the features of her subjects. 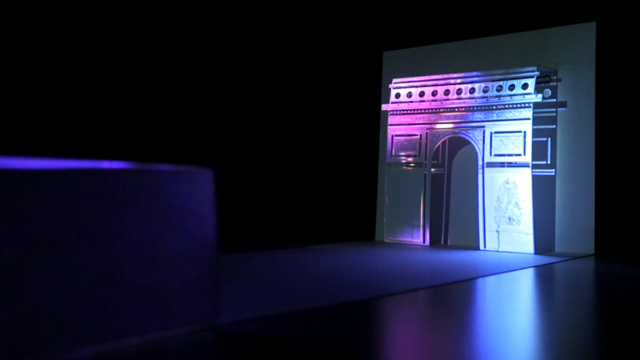 Auditoire, a Paris-based consulting agency in event communications, has created the first ever projection mapping pop-up greeting card that uses a smartphone as its video projector. In “Carte de Voeux 2014,” Auditoire projects light animations and video onto a card that opens into the facade of famous architectural buildings in Paris, Shanghai and Doha. Be sure to check out the video below. The use of colors, patterns and paper have become an important place in her work, that's why Paris-based artist Maud Vantours has become so great at what she does. 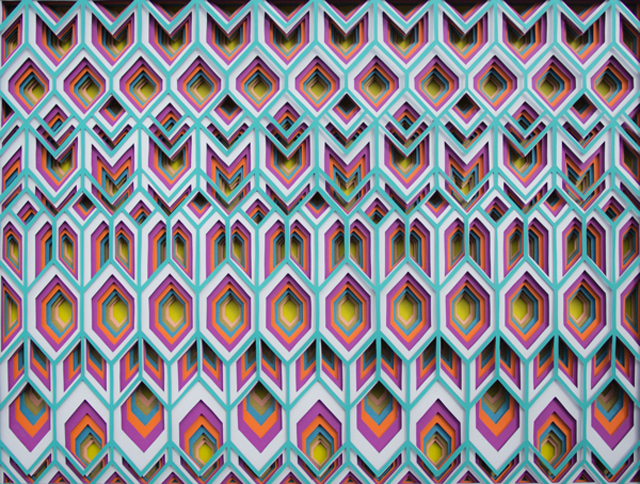 She sculpts each piece in 3D layer after layer, by superimposing paper and colors to for a collage of inspired patterns in volume. Steven Briand aka BURAYAN has created this incredible stop motion short film animation during his two month internship at Partizan. It adds several different types of dimension to paper craft and flows nicely with the music as well.